England one-day captain Eoin Morgan was the victim of a five-figure blackmail attempt after an alleged relationship with an Australian woman five years ago, cricket chiefs have revealed. Police were contacted by the England and Wales Cricket Board, which says the matter has now been resolved. The ECB will not seek further action "at this stage" against the Australian man involved, who has since apologised. He had emailed the ECB, threatening to contact media in the UK and Australia. "I am pleased this issue has now been brought to a swift conclusion," said ECB managing director Paul Downton. The incident related to a brief relationship Morgan was said to have had with the Australian woman five years ago, the ECB said in a statement. It added that the Australian man is the current partner of the woman, and had blamed "jealousy" when confronted by police. Dublin-born Morgan, 28, was appointed England one-day captain after Alastair Cook was removed from his ODI position last month. Morgan is currently in Australia with the England team, participating in a triangular series with Australia and India, a prelude to the World Cup in Australia and New Zealand starting on 14 February. 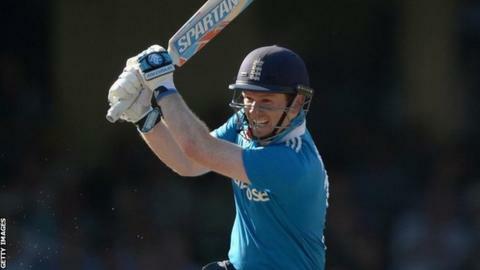 England's next match is against Australia in Hobart on Friday.